Melissa Evans was raised in Owensboro. She graduated from Apollo High School. In August of 2008 Melissa completed her Bachelor’s degree at Western Kentucky University in Interdisciplinary Studies with an emphasis in Social and Behavioral Sciences. Melissa started with the Owensboro Metropolitan Planning Commission in July 2005 as a receptionist, she has worked her way up through the Planning Department. In July 2018, Melissa became the Associate Director, Planning. 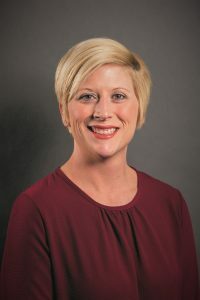 Until July 2018, Melissa’s duties included review of minor and major subdivision plats and preliminary and final development plans, preparing staff recommendations for rezoning proposals and reporting recommendations to the Owensboro Metropolitan Planning Commission, review of conditional use permits and variance applications, and being available to citizens, developers, engineers and surveyors to assist in interpreting development guidelines. She also updates several data bases supporting 911 emergency services, maintains records for all surety files and tracks transfers and releases, maintains parcel and address layers on GIS and updates the OMPC website. As Associate Director, Melissa will supervise those activities listed above as well as assume long-range planning duties including the preparation of updates of the Comprehensive Plan, revisions to the Zoning Ordinances and Subdivision regulations as required, coordination with census tract data, design and maintenance of data bases relating to land use information and special studies. Melissa is a member of the American Planning Association and the Kentucky Chapter of the American Planning Association. She is also a member of AICP, the American Institute of Certified Planners, which is the American Planning Association’s professional institute, providing leadership nationwide in the certification of professional planners, ethics, professional development, standards of planning and planning practice. In order to become a member of AICP, one must meet certain education and experience requirements in the planning profession and pass a written examination. After certification, continuing education requirements must be met to maintain the certification as an AICP member.